To begin this loop, park at the trailhead for the Trees of the Forest Interpretive Trail, which is immediately after the entrance to the Lake Sylvia Recreation Area campgrounds on Forest Service Road 152. For the brochure from the Forest Service click here. The Trees of the Forest Interpretive Trail leaves from the trailhead parking lot, but the spur trail to the Ouachita Trail (where you will start this hike) is directly across the parking lot. It then crosses the road. After you leave the trailhead, the trail begins to climb slightly. Here, you are technically on the Lake Sylvia Spur, which connects Lake Sylvia Recreation Area to the Ouachita Trail. The trail meanders through open hardwood forests for a half mile before coming to the Ouachita Trail. At the intersection with the Ouachita Trail, you want to turn left and follow the Ouachita Trail to the east. The Ouachita Trail is marked with blue blazes. After you begin hiking along the Ouachita Trail, you cross Forest Service Road 152 again fairly quickly. But here it is no longer paved. The trail swings to the south and follows the base of a mountain before crossing a beautiful creek at mile 0.8. You can see glimpses of the Lake Sylvia in the distance. From there the trail turns back to the north. It follows the base of the mountain on the opposite side of the valley before turning east again and taking hikers into the valley at the base of Chinquapin Mountain. This is a gorgeous valley with open woods and a small stream. Here the trail slowly climbs as you follow the stream deep into the mountains. I’m always fond of trails that follow mountain streams because they get smaller and smaller the higher you hike. At mile 1.65 the trail turns to the left as you cross the stream and begin heading north again. At mile 1.8 the Ouachita Trail intersects with the second Lake Sylvia Loop spur. Here you want to go left and leave the Ouachita Trail. This part of the trail is not as well hiked and gets thin in places. It is also marked with white blazes. The extended Lake Sylvia Spur Trail begins a slow climb up Chinquapin Mountain and in the leaf-off season you begin to get amazing views to the southeast. The trail skirts around Chinquapin Mountain before you come to the intersection with the spur trail to the top at mile 2.4. The intersection was marked with a sign when I was there. The spur to the overlook on Chinquapin Mountain is steep at first, but well worth the views from the top. The trail steadily climbs before you come to a series of switchbacks. I love to see the vegetation change as I climb mountains. Here the open forest from the valley turn into gnarled short trees and thick understory. Once you get past the switchback, you can see across the mountains on the other side and the valley from where you began your hike. 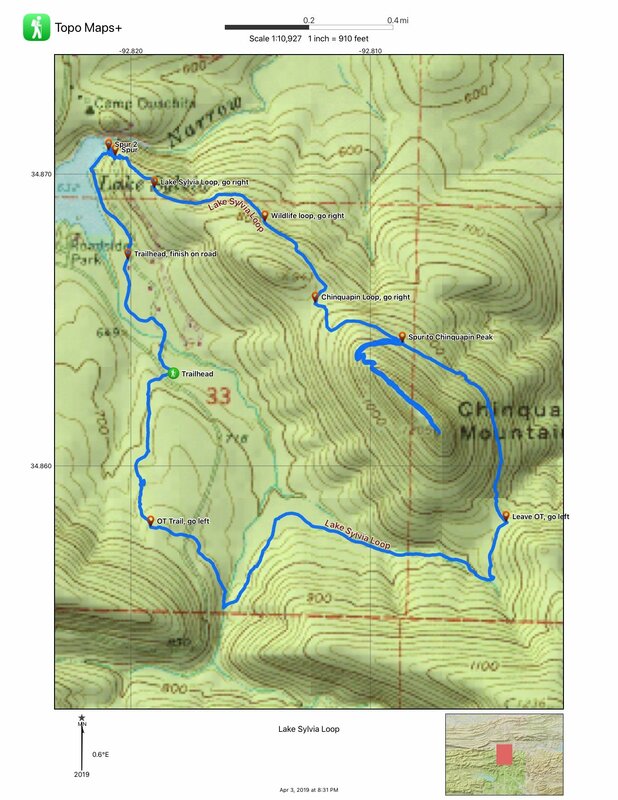 From there the trail follows the ridge of Chinquapin Mountain to the south side. The trail ends at the overlook, which is 0.4 miles from the intersection. At the overlook, you can look over the beautiful valley you just hike and all the way to Pinnacle Mountain and Lake Maumelle to the east. From there return back to the intersection the way you came. From here on in this blog when I use mileage, I’m including the total out and back out this spur trail. Back at the intersection go left or the northwest. Here the woods are open and beautiful with more views through the trees of the valley below. At mile 3.5, you come to the intersection with the Chinquapin Loop (not to be confused with the spur to the top of the mountain). Stay to the right. Here the trail skirts around another mountaintop before coming to the intersection with the Wildlife Loop at mile 3.8. Again, you will want to stay to the right. However, if you go to the left at either of the past two trail intersections you will meet back up with this trail because they both are loops. On this portion, you will see interpretive signs that explain the types of wildlife you can see in the Ouachita Mountains. At mile 4.1, there is another intersection. Here you want to stay to the right because going to the left will lead you back to the campground and you will miss the canyon, dam, and lake. Here you are on the actual Lake Sylvia Loop. Around mile 4.25 you begin to see the canyon with its cliff walls that are below the dam of Lake Sylvia. Just before the trail descends the to the dam, there is a short spur. Here you can look through the trees down into the canyon. The trail then descends down to the edge of the lake. At mile 4.35 go right to the overlook for the dam and the canyon below. From the dam, the extended Lake Sylvia Loop follows the lakeshore around to the campground. At mile 4.65 the trail ends at the campground, and you can walk along the road through Loop A and then back out to Forest Service Road 152. How does the camping work in the Forest Service recreation areas like Lake Sylvia? Can you reserve a spot or is it first-come, first-serve? Most places you can reserve through ReserveAmerica.com. However the Forest Service’s website says Lake Sylvia is all first come first serve.